Fernando de Noronha is Brazil’s paradise on earth. The archipelago comprises of twenty islands formed from the remains of volcanic mountain figures emerging from the Atlantic Ocean. Fernando de Noronha is a UNESCO heritage site and Brazil’s first marine park. Nine out of Brazil’s top 10 beaches are right here in Fernando de Noronha. The Island stands for beautiful tropical landscapes, crystal-clear waters, rich marine life, but that’s not all. “Noronha is one of the most stunning places in Brazil, if not the entire world”. Lonely Planet. 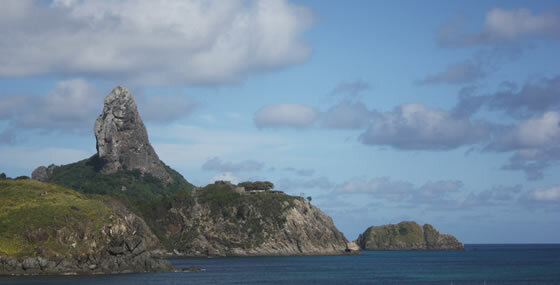 Noronha is a sacred ecological sanctuary and dream paradise for divers, surfers and hikers too. Kids and adults can amuse themselves with dolphin watching, boat tours, buggy rides, snorkeling and scuba diving. The island is famous for quite turtles conserved by Projeto Tamar and also for energetic spinner dolphins seen at the dolphin bay. Booking a flight and reserving a hotel in Noronha is not an easy task, considering the size of the islands and its tight control on the number of visitors. It's useful to know that only about 400 tourists can be at the island at any given time slot. The island houses approximately 70 pousadas. Most of the pousadas offer breakfast with the standard rate and guests can expect to dine on delicious local fruit including acai and bananas as well as granola. 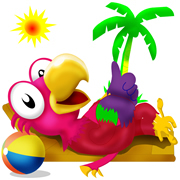 All pousadas offer free wireless Internet and you will be sure to find a hammock or two on the grounds. Planning your trip to Noronha in advance is the best tip we can give anyone desiring to visit paradise on earth. The main attraction at this island is the sea life including dolphins, manta rays, sharks, eels, giant groupers and sea turtles. There are reefs surrounding the islands with indigenous fish found no where else in the world. The water currents coming from Africa keep the waters sparkling and clear. Visibility is up to 50 meters and the waters are quite warm. This archipelago is also home to major sea bird colonies including the albatross. There is only 1 circuitous road on the mainland that connects to all important sites. Buggys can be rented but the easiest way to travel is by public bus. Hitchhiking is another popular mode of transportation and fairly safe way to travel. However, if you choose to hitchhike it would be wise to learn some Portuguese so you can tell your transport benefactor where you wish to be let off. Of course there is nothing more beautiful than the sunset and views are perfect all over the islands. The most beautiful beaches are Sancho Bay and Pig Bay and visitors are encouraged to experience both. Travel to Dolphin Bay to see the dolphins and Sueste Bay to spend some time with the sea turtles. The main reason most guests come to the island is to enjoy one of the many beaches that surround the island. But there is plenty more to do. There are boat tours, scuba diving expeditions, dolphin watching, kayaking and snorkeling. 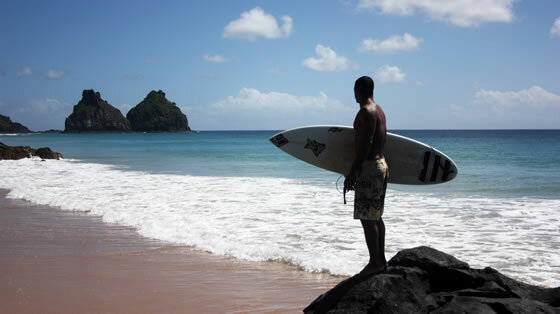 Surfers come to Fernando de Noronha as the waves are some of the best in Brazil. For those travelers who prefer to stay on land there are many hiking trails in National Marine Reserve. You will never run out of activities when visiting Fernando do Noronha. Venture out snorkeling or scuba diving into the deep blue seas, or surf your way across royal waves. Snorkel along the waters to see the abundant marine life beneath. Get friendly with the dolphins at dolphin bay and watch sea turtle birthing on a midsummer full moon. Gear up for boat tours, buggy rides and diving tours and don’t miss out on the explicit sights of the island such as the sunset. Enjoy the sunny beaches and the glistening coral reefs. Take a dip in the emerald waters and appreciate natural beauty of the island.